After our glorious day at King’s Hawaiian, the wonderful KH ‘Ohana sent us home with a huge box of goodies to fill our kitchen and tummies. ONO-licious!!! I couldn’t wait to try out different recipes with the delicious products and I started off with an island inspired French Toast. While daydreaming about warm, tropical beaches I whipped up a batch of French Toast utilizing island based ingredients– coconut, guava, and of course– King’s Hawaiian Bread. 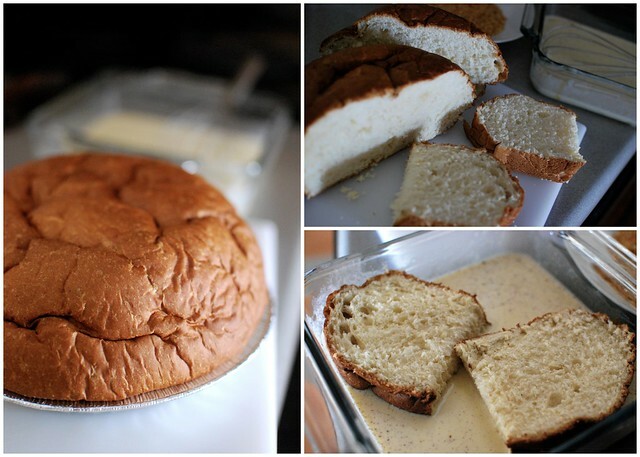 The slightly sweetened bread soaks up the perfect amount of custard base to yield a rich and creamy center. I also chose to coat the toast with Coconut Crunch pieces but if you can’t find it, non-toasted coconut flakes will also work well to create a wonderful texture. And after all this island goodness, I couldn’t bear the thought of settling for maple syrup. Lucky for me I had some guava puree on hand and was able to make a quick syrup. It was PERFECT!!! 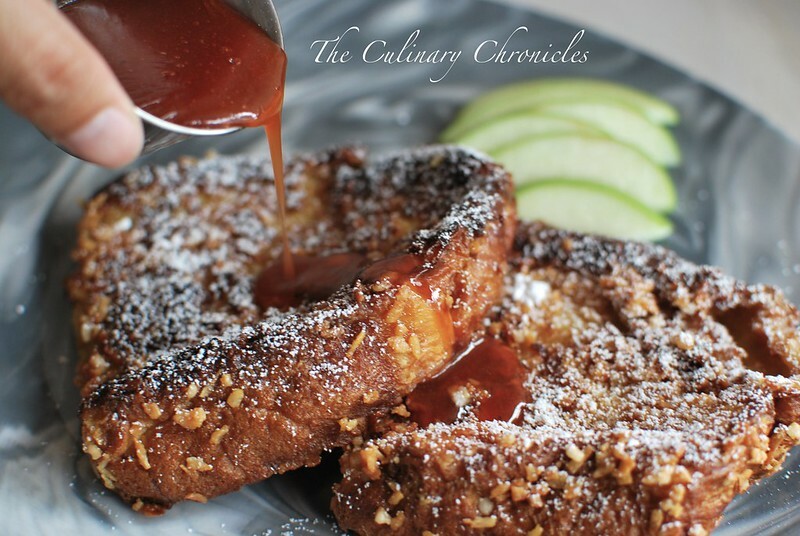 Perhaps we all can’t be whisked away to some beautiful tropical paradise at any given moment but at least our tummies can be transported there with some Coconut Crunch French Toast and Guava Syrup. Much Alohas to you all! Prepare the Guava Syrup by adding all the syrup ingredients into a small saucepan and bring to a light boil, stirring frequently. Once at a boil, lower heat to a simmer and cook down until the syrup is thickened and reduced by half. Remove from heat and warm prior to serving. In a large bowl, whisk eggs, milk, heavy cream and sugar together. Add in the vanilla extract, cinnamon, nutmeg and whisk until the sugar has dissolved and all items have combined. Pour the Coconut Crunch pieces into a shallow dish. In a large skillet, melt 2 tablespoon of butter and 1 tablespoon of oil over medium-low heat. Swirl the skillet to evenly coat the bottom. While the skillet is heating, dip the slices of bread into the egg mixture, coating each side. Lightly shake off the excess liquids and coat each side of bread with the Coconut Crunch pieces– gently pressing the coconut into the bread. Once coated, slide the bread into the heated skillet. This may need to be done in batches depending on your skillet size. Cook each side of the French Toast for 3-4 minutes until golden brown. Plate the French Toast and dust lightly with confectioner’s sugar. Serve immediately with the warmed Guava Syrup. 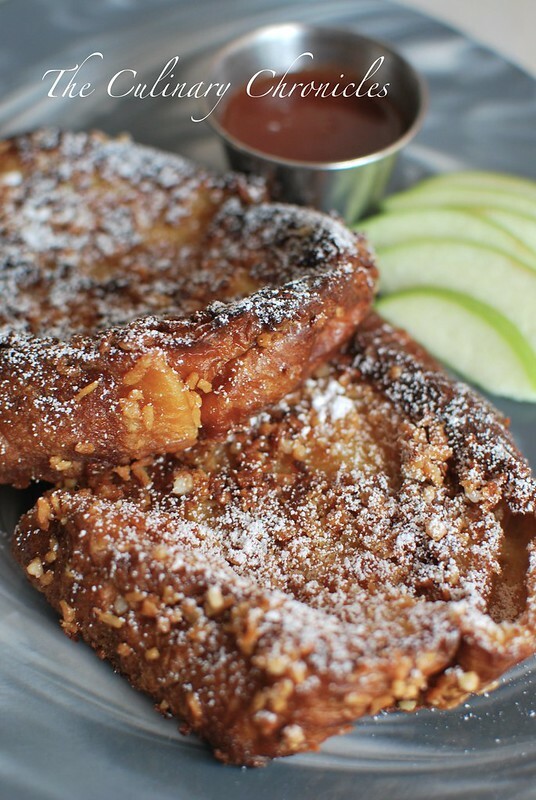 Love this tropical take on French toast – especially the coconut flakes and guava syrup. Great pictures too. Thanks for sharing. Where do you get coconut crunch? Hi Carol, I got my Coconut Crunch at a local specialty foods store but you can either get it online or substitute with coconut flakes. Cheers! This looks amazing! I have tons of guava in my yard and I have no idea what do do with it! Did you make your guava purée too? How do I make it? Hi JulieAnn! For this recipe I used Guava Puree that I picked up at my local Cuban Bakery but you can make your own. Just add the quartered (and cleaned) guava into a large pot. Add some sugar and water and bring to a boil. After a few minutes, lower the heat and simmer for about 10 -15 minutes. The guava should be nice and thick at this point. Press it through a sieve to remove the seeds and you’ll have the guava “pulp” or puree.